Despite the abundance of sustainable building technologies in today’s market, various social, technical and financial barriers have slowed the green transformation of the building market. The Archetype Sustainable House project was initiated to educate and motivate the public and building industry professionals to move beyond these obstacles and to adopt greener building practices. By showcasing the best green technologies and designs the market has to offer in a real-world, full-scale demonstration, the house reveals the feasibility of building homes that use less energy, water and natural resources, and generate less waste, while also being more comfortable and providing a healthier indoor environment for occupants. The following primary themes were incorporated into the design of the Archetype Sustainable House. Click on each theme to learn more. In 2005, Toronto and Region Conservation Authority (TRCA) and the Design Exchange launched the Archetype Sustainable House Design Competition, which engaged architects, engineers, designers and graduate students from across Canada. The challenge was to design a viable, sustainable single-family dwelling that would serve as a model or “archetype” for future housing developments in the Greater Toronto Area and beyond. In June 2006, the “Building Blocks” entry was selected by a panel of judges as the winning design. Two identical houses were built in three months during the summer of 2008. House A was intended to be equipped with technologies that are practical in today’s market, while House B would showcase technologies of the future. The Archetype Sustainable House was designed and constructed as a living laboratory for the testing and research of sustainable building technologies. More than 400 calibrated sensors monitor the performance of the building’s systems, incoming and outgoing energy fluxes, and internal environment conditions. An on-site weather station measures outdoor meteorological conditions, providing site-specific climate data. A National Instruments data acquisition system is used to process data received from the various sensors and is programmed to provide real-time monitoring and data processing. Measurements are also collected and recorded in an MS SQL database. Plug-and play capabilities enable removal and installation of new systems and technologies for testing and evaluation as they become available. Since its construction, more than 40 PhD and Masters theses have been conducted on the house. This house provides industry a chance to verify, demonstrate and pre-commercialize project ideas while providing students with a real-world learning facility. The Archetype Sustainable House also serves as a key educational tool around which school programs and green home workshops have been developed. In addition, monitoring programs are carried out in order to evaluate the performance of the two houses with respect to water conservation, stormwater management, and energy efficiency. Experienced staff from the STEP program conduct independent third-party product evaluations at this Lab. This research yields valuable information on the performance of these technologies and helps to determine best practices for their operation and maintenance, which STEP disseminates to industry, government, academia and the general public. This Living Lab is also a place to evaluate costs and savings associated with individual technologies and materials will also be assessed relative to conventional alternatives to determine pay-back periods and assign a dollar value to the energy and water conservation data. Efficient use of clean energy is an important part of a sustainable home. There are so many ways in which you can make your home more energy efficient. The Archetype Sustainable House incorporates all the following advances in energy efficiency. House A is intended to demonstrate practices and technologies that are current and practical today. House B demonstrates practices that you will see in future. Come out and visit the Kortight Centre in Vaughan to experience more. » Double paned, low “E”, fiberglass framed windows – Heat loss is greatly reduced with the use of low-E [low-emissivity*] treatment for the glass which reflects heat back into the house during the winter and blocks out radiant heat during the summer. » Triple glaze, low “E” argon windows – The third layer of glass greatly enhances this process making the window a heat processor all on its own. *Emissivity is a measure of a material’s ability to radiate absorbed energy. » Roxul Batt Fibre Insulation (R21) which is a fire resistant product. Has three inches of Styrofoam on the outside for a total of a R30 wall. This high efficiency insulation allows for a high percentage of heat and air conditioning environment retention through a higher reduction in air exchange through walls, windows, doors, sills, attics/ceilings and more. » Spray foam insulation is used. Two different products were used in different parts of the home: Heat-Lock Soya Polyurethane Foam and Icynene spray foam. Spray foam insulation minimizes air leakage for increased energy efficiency, creates a healthier indoor environment, reduces airborne sounds and offers greater design freedom. Solar orientation for passive solar gain which aims to maintain interior thermal comfort throughout the sun’s daily and annual cycles while reducing the need for active heating and cooling systems. Energy Star® appliances are used in the house. Energy Star® qualified appliances incorporate advanced technologies that use 10 to 50 percent less energy and water than standard models. Lighting is all using compact florescence bulbs which use less power and have a longer rated life. Effective and efficient use of water is an important part of a sustainable home. The Archetype Sustainable House incorporates all the following advances in water efficiency. Hands free fixtures so when you don’t need the water it is not running! Planting of native plants and species which are drought tolerant. Bioswales are landscape elements designed to remove silt and pollution from surface runoff water. They consist of a swaled drainage course with gently sloped sides (less than six percent) and filled with vegetation, compost. Permeable pavement which will allow more water absorption into the ground below through paved areas like the driveway. Cisterns are storage tanks for rain that has been collected from the roof or other areas. The homes include these storage units for rain water disbursement. Point of entry water filtration equipment is included the houses. Both house A and B have a French drain which pumps the water into a large 6000 litre cistern around the foundation wall. The water collected from the French drain around both houses flow to the cistern. This water is then used for toilet water in both houses. The houses have a wetland wastewater treatment system that treats all the sewage water. Canadians spend close to 90% of their time indoors. Most complaints about indoor climate conditions relate to thermal comfort. Improving indoor comfort can enhance productivity, health and our sense of well-being. Alterations such as reduction of forced air heating and improved indoor/outdoor air exchange can promote both thermal comfort and energy efficiency. House A is intended to demonstrate practices and technologies that are current and practical today. House B demonstrates practices that you will see in future. House A: Key mechanical system components for forced air heating. » Heat Recovery Ventilator (HRV): an energy efficient way of controlling humidity and achieving better air flow within a building. » Air Handler: an important component of the heating, ventilation and air-conditioning (HVAC) system working in conjunction with other key system components to provide adequate ventilation and facilitate efficient air circulation. » Mini Gas Boiler: a “finishing” heater, bringing the pre-warmed water from both the flat plate solar collector and the drain water heat recovery system up to the optimal temperature for use throughout the house. » Flat Plate Solar Collector: The collector is mounted on the roof and heats water using the sun’s energy. » Drain Water Heat Recovery: designed to capture waste heat from hot water flowing down the drains. House B: Key mechanical system components for forced air heating. » Ground Source Heat Pump: part of a system that exacts and stores heat from the ground during cooler months or heat from within the building during warmer months. » Zoned Air Conditioning Unit: During the summer months cold water from the ground source heat pump is delivered to the fan coil in the zoned air handling unit. Forced air then delivers cool air to each floor via separate duct work. To efficiently control cooling, each floor has its own thermostat, therefore dramatically reducing the need for cooling. Certain material such as wood and the paints used should be to considered when thinking about sustainability of the home. The Archetype Sustainable House incorporates the following advances in resource efficiency. FSC wood – FSC stands for The Forest Stewardship Council and was created to change the dialogue about and the practice of sustainable forestry worldwide. For more information about FSC visit www.fscus.org. Advanced construction framing, 2″ x 6″ on 24″ centres was used, which means the amount of wood used in framing needed was greatly reduced. R20 basement walls were made with Durisol blocks. “R” stands for resistance against heat flow so this home exceeds normal building standards by 30 per cent. » Cork flooring – No cork trees are cut down, only the bark is peeled without destroying the tree, and it grows back within nine years, ready to be harvested again which makes it an incredibly renewable resource. » Bamboo – Botanically, bamboo is not a wood at all, but a grass. It is attractive as a building material because it is very hard, strong, and dimensionally stable. Environmentally, it is hard to argue with a wood-substitute that matures in three years, regenerates without need for replanting, and requires minimal fertilization or pesticides. Low volatile organic compounds (V.O.C.) paints and solvents we used on this project. Volatile organic compounds (VOCs) are organic chemical compounds that have high enough vapor pressures under normal conditions to significantly vaporize and enter the atmosphere. High Volume Fly Ash Concrete (HVFAC) was used in this project. Currently in the concrete industry, the percentage of fly ash as part of the total cementing materials in concrete normally ranges from 15 to 25 per cent, although it can go up to 30 to 35 per cent in some applications. The use of fly ash in concrete will improve some aspects of the performance of the concrete. For more information on HVFC visit www.hvfacprojectindia.com. Design and construction of the Archetype Sustainable House achieved the following building certifications promoting sustainable design in the building industry. 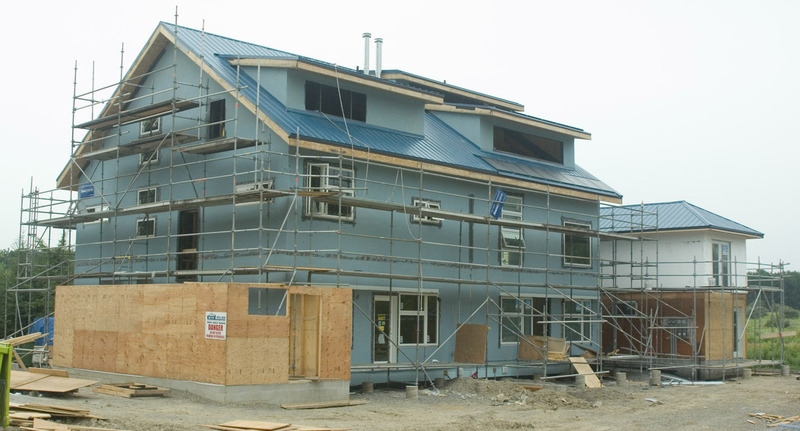 For more information on LEED for homes visit www.cagbc.org. Energy Star® joint programs help us all save money and protect the environment through energy-efficient products and practices. For more information visit www.energystar.gov. R-2000 homes are the most energy-efficient and environmentally responsible new homes on the market. They are built to demanding standards for energy efficiency and indoor air quality that far surpass others in the marketplace. Learn more about R-2000 certification HERE. One in three people over the age of 65 will have a disability at some point in their senior years and one in four Canadians will be over the age of 65 by the year 2045. Research is showing that many seniors will move more than once in the later stages in life. Often this is a result of either the lack of appropriate and accessible housing or the lack of proper caregiver supports. When surveyed, 85% of seniors expressed their preference for aging in the place that they live. 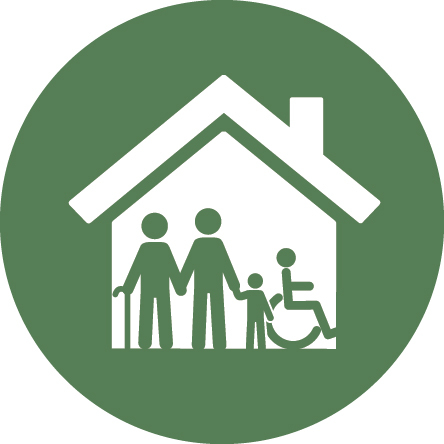 Given that the proportion of our population, made up of older adults with disabilities, is growing quickly too few people are aware of the benefits of modifying their homes to be more comfortable, safe, and supportive of their lifestyles and their changing family needs. Modifying homes to be safe and accessible is key to accommodating the changing needs of our aging population as well as younger people living with disabilities (Credit: www.homemods.ca). In 2016 a series of industry experts convened to assess the living conditions in House A with a means of providing a series of recommendations, that when implemented, would provide for a more accessible and thoughtful environment that was conducive to inclusive living. Low Flow Toilets – In addition to being water efficient, this toilet uses a handsfree flushing system and is equipped with a soft closing lid and an EverClean® Antimicrobial Surface and a PowerWash™ feature each of which ensures a more hygienic environment. This particular “right height” model is also slightly higher than standard models which makes it easier for elderly people and people with physical disabilities to use. Vanity and Faucet – This custom vanity and hands free faucet have been designed with inclusive living in mind. The vanity has been designed to allow for wheelchair accessibility and the hands free faucet allows for easier operation by the user; a great feature for people who have difficulty with manual dexterity. The faucet is equipped with a SmarTherm™ feature which prevents accidental scalding in the event of a hot water surge or interruption to cold water. Again, a great safety feature for homes with children or elderly residents , or for people with cognitive disabilities. By presetting the temperature control valve to an optimum temperature for household members the hands free faucet also minimizes germ transmission which provides for a cleaner environment. Barrier Free Shower and Grab Bars – The shower in House A is different from other walk-in showers in that the flooring is flush throughout the bathroom as opposed to having a raised curb around the shower base. This is a unique feature that allows for wheelchair access and improves accessibility overall for people with mobility issues. In addition, the use of a shower curtain as opposed to glass walls, results in more useable space in the shower area. This is an important consideration for residents requiring assistance by a personal support worker or family caregiver and the additional space also permits wheelchair movement and turning in the shower. This bathroom is also outfitted with strategically placed & supported grab bars which provide mobility assistance and increased safety for users. Grab bars can be integrated with other functional elements in the bathroom to serve dual purposes and to minimize the institutional appearance (i.e. integrated paper roll holder and grab bar). Picnic Table – The wheelchair accessible picnic table at House A is designed specifically for wheelchair accessibility. The table is also environmentally friendly as it is made from 100% recycled plastic and the table itself is also fully recyclable at the end of its life. During the manufacturing process any off cuts are fed back into the system where they are reshredded and reused so that no plastic is wasted. Along with being decay resistant and weather proof, the table is extremely cost effective as its durability and long life eliminates any maintenance or replacement costs. This project was made possible through generous support of all our sponsors.